Receiving adequate nutrition is a must for seniors (especially those with health conditions,) so spouses and other home caregivers often begin to put extra effort into infusing more fruits and vegetables into meals and snacks. 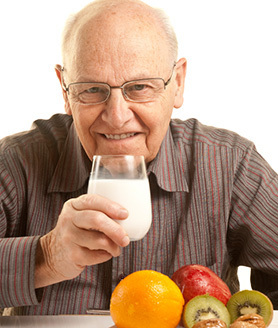 However, many foods that are considered healthy may react negatively with popular elderly medications. It is an important part of home health care to thoroughly investigate each medication so that family caregivers understand what foods to avoid when the elder has taken that medication. The following are several foods that react negatively with popular elderly medications. It can be dangerous to eat grapefruit or drink grapefruit juice while taking many types of medications. Certain blood pressure medications and cyclosporine, an organ transplant anti-rejection medication, will be processed differently by the body when grapefruit has been eaten. The levels of the medications in the blood stream will be concentrated, making it possible to overdose or experience side effects from the medications. Certain anti-anxiety and insomnia medications may also become concentrated in the blood when taken with grapefruit. Leafy greens are touted as some of the healthiest foods around, but eating lots of leafy greens can be dangerous for seniors that are on blood thinner medications. While making salads and cooking broccoli may seem like good home health care management, the truth is that the vitamin K content may counteract the effects of blood thinners-speeding up the body’s natural blood clotting abilities. Home caregivers should work with doctors to determine how much is too much when it comes to balancing vitamin K and blood thinners, as the other nutrients present in leafy greens may still be very beneficial to health. Whole grains and other foods that are high in fiber (including fruits and vegetables) are often marketed as miracle foods for seniors because of the digestive, anti-cancer, and anti-diabetes benefits of those foods. However, fiber slows the rate at which the stomach empties, so medications are not absorbed into the blood stream as quickly. This reaction can cause antibiotics and other medications to be less effective. Bananas are very high in potassium, which can help to lower the risks of heart disease and strokes. Unfortunately, ACE inhibiters that are used to lower blood pressure increase the potassium levels in the body, so eating bananas while taking these can cause potassium levels to skyrocket to dangerous levels. This can cause heart palpitations. Bananas also contain tyramine, which can cause adverse reactions when taken with MAO inhibitors.